Are you going to be in the New York City area this weekend? If so please join us for the Annual Genealogy Conference hosted by AAHGS-NY and LDS this Saturday, March 18th, 2017. Pre-conference activities will involve volunteer assisted questions and answers by consultation and computer. Research-directed story-telling and information sharing by AAHGS-NY members. I really enjoyed Season 1 of Relative Race, I even binged watched all of the episodes (I got hooked). Well, I am looking forward to this season and I hope it is just as good as the first one. The premise of the show is four couples start off in Miami and they’ll have to complete challenges in order to meet a new DNA relatives each day for 10 days across the United States. They will have to navigate without using smartphones or GPS devices. The couples will be given road maps and burner phone (phones with not internet access). The team that wins will get $50,000. Check out the first episode of Season 2 below. Last night during our BlackProGen LIVE episode (which was very good, check out the previous post to watch) we discussed the importance of telling our story. If we don’t tell our story who will? Who’s going to give it justice? As genealogist and family historians I think we have a duty to share and what we have researched with not only our family but the general public as well. As black people, it’s especially important for us to tell and share our story as well. In some instances, black people have been written out of the history books. If we are telling our own stories this won’t happen. Tell your young family members who their ancestors were, talk about their hardships and their accomplishments. Knowing I came from strong, hardworking, family oriented, business-minded, god fearing people makes me proud and when I feel like giving up I think, nothing in my life today can compare to what some of my ancestors had to endure so I keep going because they kept going. I say share, share, share, share your family’s history by blogging, writing a book publishing, or even writing facebook posts. Tonight the Progen LIVE panelists are back it again! 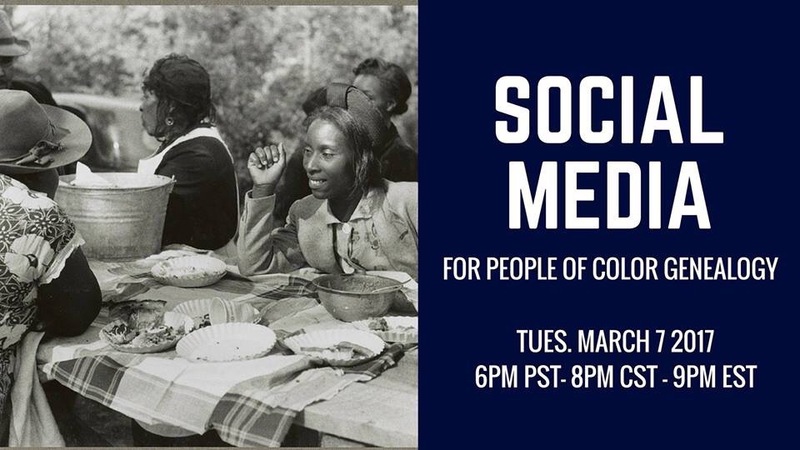 We’ll be discussing social media for people of color genealogy. The ninth season of Who Do You Think You Are? premieres this Sunday, March 5th on TLC. This season’ s celebrities include Smokey Robinson, Courteney Cox, John Stamos, Liv Tyler, Jessica Biel, Julie Bowen, Jennifer Grey and Noah Wyle. Last night I was doing a research and came across the Slave Narratives: A Folk History of Slavery in the United States From Interviews with Former Slaves; Volume: I; State: Alabama (click here )Compiled by the Federal Writers’ Project of the Works Progress Administration in the 1930s, there are over 2300 individual accounts of slavery, and 500 photos of former slaves. Information may include surnames of interviewees, birthplaces, ages, parents names, former slave owners, and interview location. I found Mr. Abe Whitess on page 423 he was born in Mississippi and worked on Colonel Rupert’s plantation in Butler County, Alabama after he was freed. Mr. Whitess moved down to Bay Minette, Alabama. I have a large portion of family down there so of course, I wanted to know a little bit more about him. Mr. Whites worked odd jobs and became the chairman of the republican party, according to his interview. Mr. Whitess even owned 14 acres of land, he donated part of his land to open a part Douglasville, the area of Bay Minette he resided in, for a public road. After doing that the people pf the community, mostly African American dubbed Mr. Whitess the “Mayor of Douglasville”. I plan to read more interviews, I find their stories really interesting and it gives me a glimpse into what life was like for an enslaved person. Checkout Mr. Whitess’ interview below.